Today, I’m participating in the WordPress weekly photo challenge and this week’s theme is color. But here’s the trick: I’m sharing the bursts of colors on my photography website, so hop on over if you’d like to add some yellow, orange, pink and purple to your day. 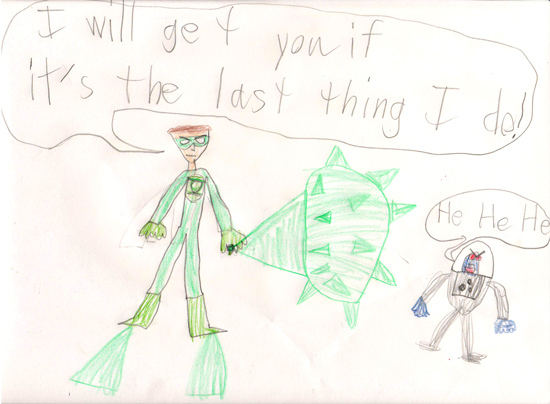 I noticed I didn’t have much green in that post, so here’s some green here, courtesy of my six-year old son, who’s a big fan of super heroes, including Green Lantern. The villain he’s fighting is Mister Freeze, in case you’re wondering. 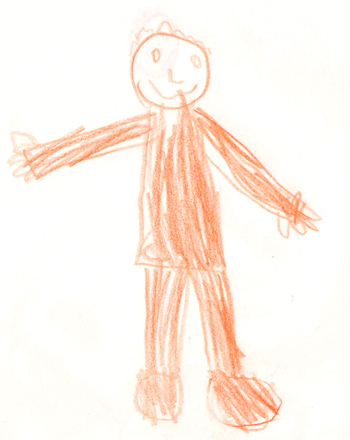 And here’s my five-year old’s very first self-portrait, all in orange. I think he did a great job! Drawing is a daily activity at our house. In fact, the colored pencils have a permanent spot on our dining table. We also have markers, crayons and paint in the downstairs closet, easily accessible thanks to our IKEA storage bins. My six-year old has shown a special talent for drawing after he turned four. Since then, his drawing abilities have improved steadily and now, he gets to help out and advise his little brother. And excellent drawing skills turn into beautiful handwriting, so I can’t complain. Today I’m using my bragging rights as a mom to display a couple of my kids’ latest masterpieces. Isn’t that what moms are for? My youngest still has a lot of room for improvement but by now I can often figure out what he’s drawn. At four and a half years old, he mostly likes to draw dinosaurs and monsters caught in dramatic situations. Here’s an undiscovered species of dinosaur (similar to a Tyrannosaurus Rex but with a longer neck, as he describes it), right next to an erupting volcano. The purple shapes at the bottom are the dinosaur’s eggs and you’ll notice it’s raining (a lot). All I can say is, that’s a lot of teeth! My six-year old drew this Puss in Boots from the latest movie when he wasn’t even six, from a small image on my cell phone. Right on! He loves Lego Ninjago, ninjas and superheroes, so that’s usually what he draws. He also likes to draw vehicles: police cars, helicopters, submarines, you name it. What can I say, he’s a boy! 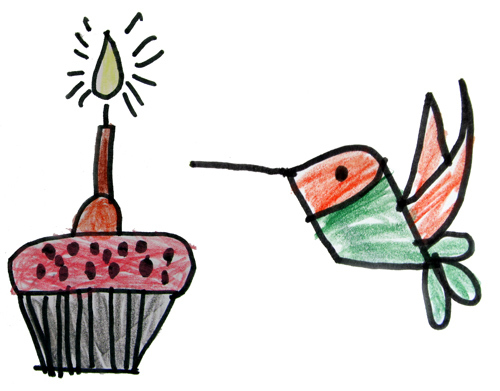 If he can draw like that at not even six and a half, I can’t wait to see how well he’ll be drawing in a few years. Actually, I can’t wait to see how both of them will be drawing in the future. I’ve drawn all my life too and I’m excited to see how much they like doing it. And you should see the Lego structures they create! But that’s for another post. Do your kids have special talents? Did you have special talents as a kid? If so, do you still display your talents today? Hungry for a snack? 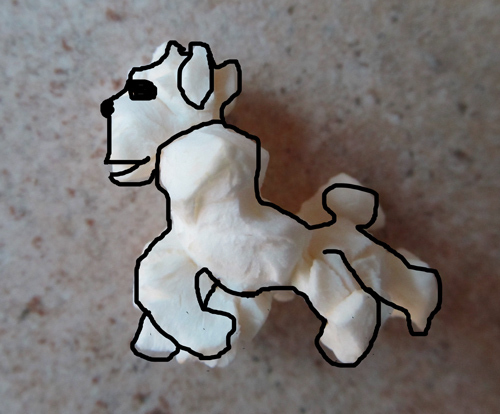 How about some popcorn art? You may have noticed I didn’t do a WWW Wednesdays update yesterday. There’s a simple reason for it. I’m still reading the same book and I feel like the slowest reader on the planet right now. I’ve been going to bed so late every night recently (a terrible habit to start), I just want to turn off the light and go to sleep when I get there. 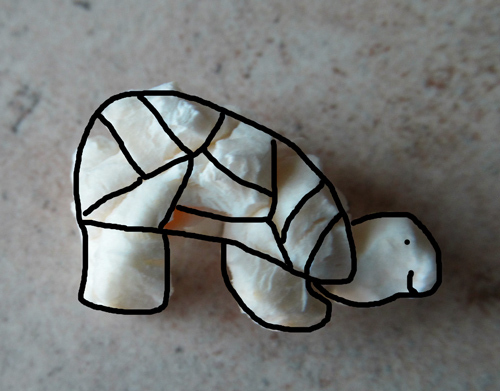 If you enjoyed my recent post of food art and it left you hungry for more, don’t despair. I have just the right fix for you. 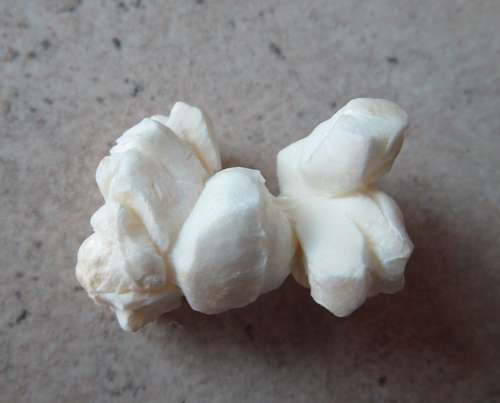 Have you ever made popcorn at home? 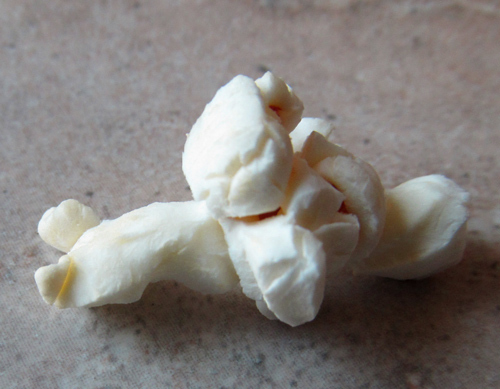 Have you ever looked at those popped kernels before you shoved them down your throat nibbled on them while watching a movie? 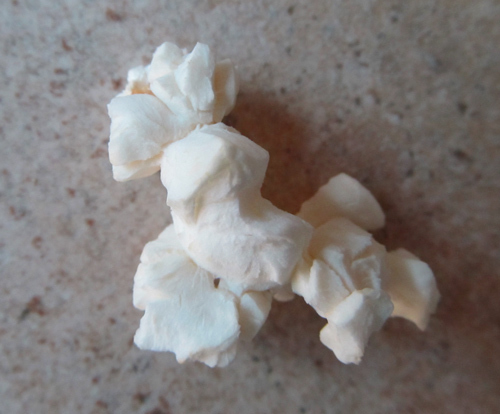 Here are a few shapes my kids and I recently spotted while snacking on popcorn. 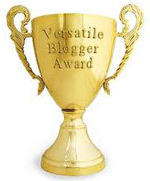 For the visually / spatially / creatively impaired (pick one, you know who you are! ), I added some visual clues thanks to Photoshop’s paint brush, so you can see what we saw. Ready to play the game? Here we go! Scroll down slowly so you can guess. No cheating! Can you guess what this shape is? I’ll give you a clue. It’s an animal that walks very slowly. It’s a turtle! Don’t believe me? See it for yourself. Don’t despair if you didn’t get it, it takes some practice. Now that you understand how to play the game, let’s continue, shall we? I’m not going to give you a hint for this one because it’s easy to guess, but I’ll tell you a lot of kernels pop this way. 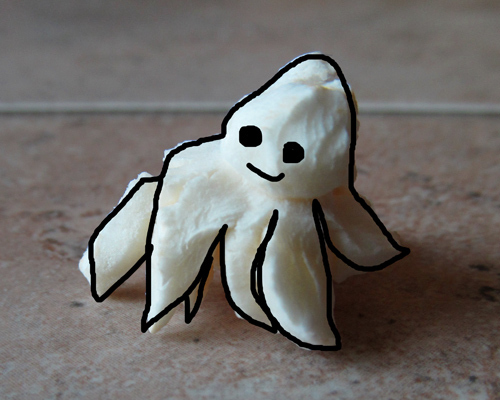 Alright, just in case you couldn’t figure out, here’s the answer: it’s an octopus. The next shape is a little similar to the previous one, at least when it comes to the number of limbs. This is the only clue you’ll get from me. 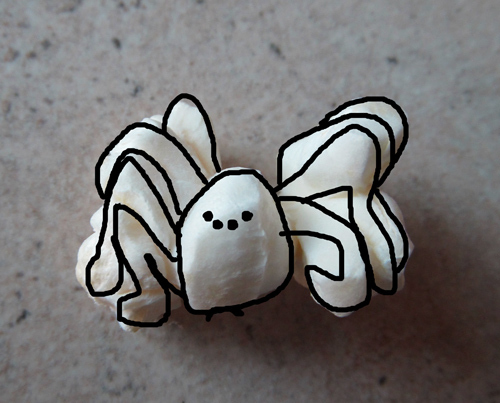 If you said spider, you’re right! Alright, now that you’re warmed up, here is a more difficult one. This animal also “walks” very slowly. 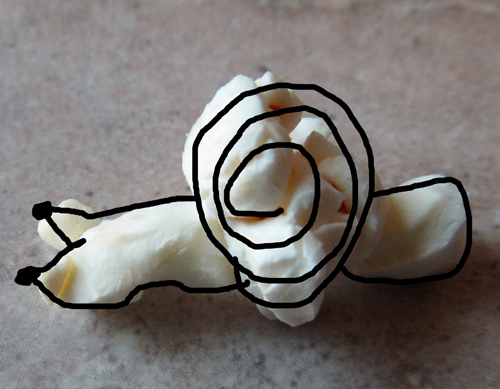 It was a little harder but if you said snail, you’re really good at this game. 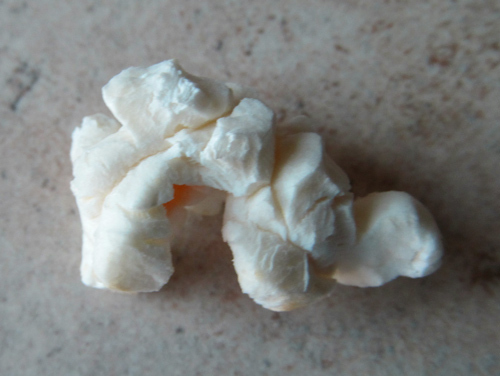 Here’s the last popcorn kernel for you to guess. It’s often described as a loyal animal. If you guessed dog, give yourself a cookie! How did you like this game? 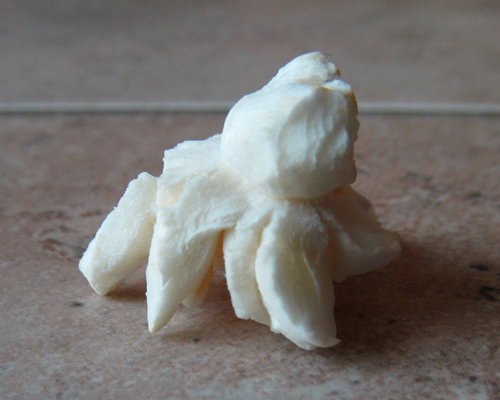 Will you give it a try next time you have popcorn? It’s fun playing with food, believe me. 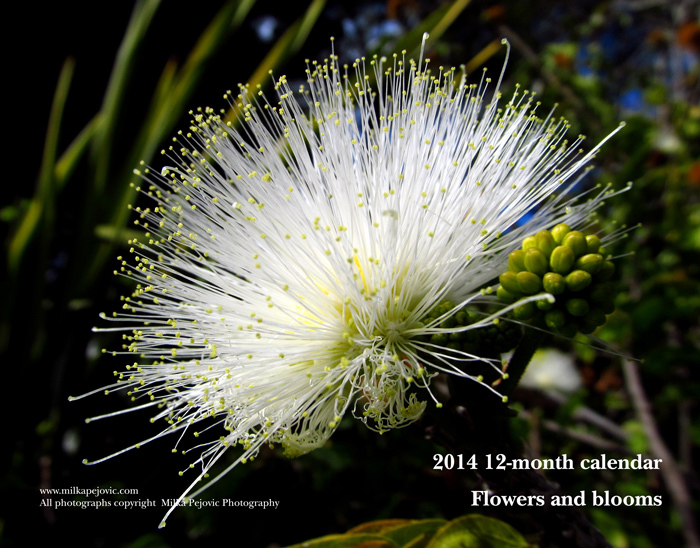 When I saw the WordPress weekly photo challenge theme on Friday morning, I knew right away what my pick would be. Since my five-year old loves to draw so much, I recently signed him up for sketching classes and the first class was last Thursday afternoon. His comment about the first class: “That was SO MUCH fun!” The teacher showed the kids how to draw simple pictures step by step using a wonderful book (yet it’s out of print) called “Build a Doodle“. They drew outlines for eight items during the class and the teacher encouraged them to color them at home. Here are two of the drawings my son drew. Simple, yet lovely. I’m a proud mama. But then on Friday afternoon I got one of those calls that changes it all. The call that makes the world collapse like a deck of cards around you. My husband went skiing over two hours away from our house that day. He had a very bad fall and suffered a traumatic brain injury (thank god for his helmet). He was airlifted to the nearest hospital and stabilized. We spent half the day Saturday in the car to go see him, although the kids had to stay in the waiting room as kids weren’t allowed in the intensive care unit. I quickly realized he wasn’t well physically and mentally. I requested him to be transferred to our hospital close to home and got my request fulfilled on Sunday night. He’ll hopefully get all the physical and cognitive therapy he needs over the next weeks (or months) to recover. Fingers crossed. The hospital wanted me to take some of his belongings so I left with his cut-up clothes, his watch and his wedding ring. 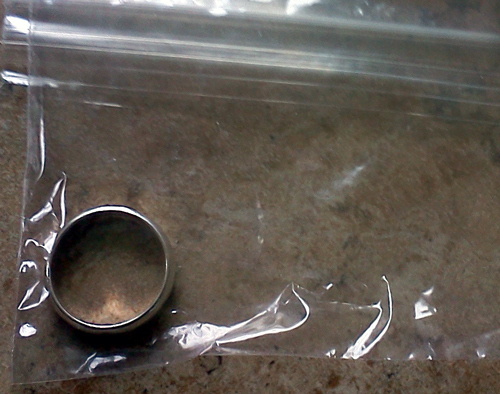 A simple wedding ring, in a simple plastic bag. Yet a constant reminder that my husband is in the hospital instead of at home with us.